University of New Brunswick researcher, Yun Zhang, is no stranger to Google Maps. In 2000, he participated in a Street View project led by YC Lee that resulted in Google Street View. Now he’s invented what he hopes will be the next generation of Google Maps called EarthView3D. Dr. Zhang is a Canada Research Chair in Advanced Geomatics Image Processing in UNB’s faculty of engineering. He says there are many benefits to 3D maps and he’s hoping to see 3D technology become more mainstream in the coming years. Currently, no one has developed anything like this and the UNB patent-pending technology is ready to be shared with the world. Using NASA’s satellite images, the technology can create 3D satellite images. The team has developed the 3D software and the EarthView3D prototype that covers Canada, the United States and Nepal. A detailed 3D prototype with up to two meter resolution is also developed that is located in Arizona on the US-Mexican border. Dr. Zhang says they need industry partners, so they can more effectively advance the technology to show everyone with internet access and a 3D monitor what the entire planet really looks like. “I want to see this become the next generation of online maps and become usable for the whole world,” said Dr. Zhang. 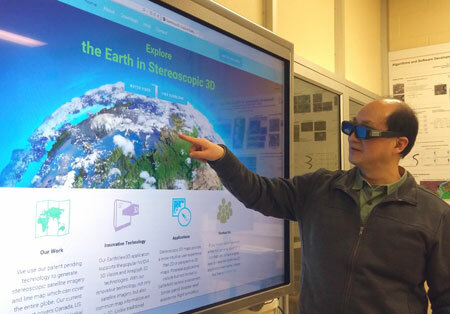 Dr. Zhang recognizes that not everyone will have access to a 3D monitor. His team is developing a solution for making the technology portable and more accessible using Google Cardboard and a smart phone. The UNB research team, which consists of Dr. Zhang, technical experts David Fraser and William Liu, and a group of graduate and undergraduate students are excited to see where this technology will go. An expert in remote sensing and photogrammetry, Dr. Zhang has had a very successful research career—inventing six patented technologies, three of which were done with his students. Along with his EarthView3D technology, he has three other technologies that are patent-pending. His work has resulted in the technology enhancement of several mapping companies including PCI Geomatics, DigitalGlobe and Intermap Technologies and the creation of one company Scene Sharp Technologies.